Marcelo Ferreira has been promoted to the position of head coach of the Pepperdine men’s tennis team, as announced by director of athletics Steve Potts. "I believe Marcelo Ferreira to be a rising star in the collegiate tennis coaching field," Potts said. "He is a great fit for Pepperdine in that he is committed to the academic well-being of our student-athletes, committed to the continuance of the championship tradition of our men's tennis program, and, most importantly, strongly committed to the Christian mission of our institution." Ferreira is the 14th head coach in the program's storied history, dating back to the 1940s. This is the Brazilian native's first appointment as head coach after spending the last eight years as an assistant. Adam Steinberg, who preceded Ferreira, was responsible for hiring the promising young coach. "I am extremely thankful to Dr. Potts and President Benton for their trust in my ability to lead this team and coach the fine young men who are a part of it," Ferreira said. "Adam Steinberg and all of the coaches before him were responsible for nurturing this program into one of the most respected and successful programs in the country. It is an honor and privilege to lead this team and I am committed to furthering its legacy." Prior to coming to Malibu, Ferreira spent five seasons at Texas Tech University as an assistant coach before being promoted to the role of associate head coach during the 2012-2013 season. Ferreira has already helped further the legacy of Pepperdine tennis. In his first season with the Waves, Seaver College rising senior Alex Sarkissian ('14) became just the third player in program history to reach the finals of the NCAA Singles Championship. In addition to earning ITA All-American status in singles, Sarkissian was also an All-American in doubles alongside Francis Alcantara. Unseeded, the duo reached the quarterfinals of the 2014 NCAA Doubles Championship in Athens, Georgia. Ferreira was twice named the ITA Texas Region Assistant Coach of the Year during his tenure with the Red Raiders, first in 2010 and again in 2012. Texas Tech went 103-54 (.656) with Ferreira on the coaching staff and made five consecutive NCAA Tournament appearances from 2008 to 2012. In his six years on the sidelines—by far the most successful six-year span in program history—the team finished ranked in the ITA top 25 an unprecedented four times. 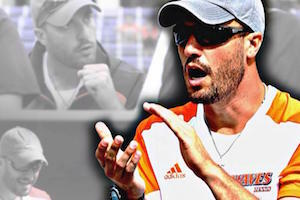 After graduating from Georgia College & State University (GCSU) in 2006, Ferreira remained in Milledgeville, Georgia, for one year to serve as the assistant coach for both the men's and women's tennis programs. Ferreira's coaching career began in 1998 at the Mauro Menezes Tennis Academy in São Paulo, Brazil. He also lent his expertise to the Alphaville Tennis Club. After moving to the United States, Ferreira founded 2SV Sports Management, a company that organizes events and tournaments for foreign prospective tennis players. Soon after, he became the director at Future Stars Tennis Camp in Southampton, New York. Ferreira graduated from GCSU in 2006 with a physical education degree. He was a three-year letter winner on the tennis team and earned Peach Belt Conference Presidential Honor Roll status every season. He later earned his master's degree in education, with a focus on human performance and sports management, from Texas Tech.